In general, one can define an infinity of moments for any solid object in any dimension, which captures interesting features of the object. One can think of them as a generalization of the center of mass, which coordinates are the first-order moments. In images, the second-order moments can be used to determine the equivalent ellipse of an object, from which one can extract the orientation of the major and/or minor axes. That's what we are going to put into practice and discuss in this post. Warning! One of the research articles that present this calculation (and actually the one that brought my attention onto this method for image analysis) is Image Moments-based Structuring and Tracking of Objects by L. Rocha, L. Velho and P.C.P. Calvalho (2002). Unfortunately the formulas for $l$ and $w$ have a typo in this paper, with factors 6 instead of 8. This does not change a lot the resulting ellipses, but it's always better to use the right formulas so take the ones presented here, they've been double-checked and extensibily tested in many occasions. Now that we have all the theoretical tools, let's pass on to practice. A package containing optimized Matlab functions for computing and displaying the equivalent ellipse is provided at the end of this post. 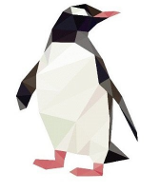 %   E = IM.GET_ELLIPSE(IMG) finds the equivalent ellipse of an image IMG. %   be unchanged but the direction is pi-undetermined. The equivalent ellipse overlaid onto the original binary image. By default, the equivalent ellipse has a correct orientation but a random direction (here, indicated by the dot) that can change from frame to frame. To correct for this, one can use the third moments, which contains information about "how asymetric" the object is. The easiest way to use the third moments here is to rotate the object around it's center of mass to make the major axis horizontal and compute the skewness of the new horizontal coordinates. A positive (resp. negative) skewness indicates that the point are more grouped on the left (resp. right) side. This property is implemented in the IM.get_ellipse function (lines 64-78). The equivalent ellipse is well-oriented after correction with third-order moments. Needle gauge sample movie (car tachometer filmed with a cell phone). At first sight, it looks like a tough task, especially when one considers that the video is of quite low quality (look at it fullscreen) and that there is an important translational motion due to vibrations. However, this is an easy task for image moments. The signal is correctly extracted from the movie, despite the high translational noise. Speed. Algorithms based on image moments are fast, very fast. So fast that it can be implemented without further tweaking in live tracking algorithms, even at high framerates. 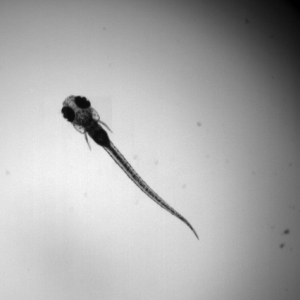 For instance we have used it in the lab to track the tail beats of zebrafish larvae, and it was running flawlessly in real-time at 200Hz with Matlab and at 500Hz in C++ (image size 256x256 pixels, regular workstation). We took benefit of the speed of this algorithm in this article, where a fast feedback loop was implemented to make a 2D virtual reality setup. Binary or greyscale images ? The definition of image moments is also valid for greyscale images, so one can imagine to get rid of the binarization step an directly use the full image information. However, though this is possible in theory, in practice there is an important pitfall. Effect of the contrast on the ellipse aspect ratio. While the background level is raised logarithmically from 0 to 1, the ellipse aspect ratio $w/l$ drops to one. For a perfect contrast, the ellipse is well-defined and has an aspect ratio $w/l$ close to 8. As the contrast decreases, the aspect ratio steeply drops and is already at half the maximum value for a contrast of 1000:1, a value hardly ever reached in pratice. Clearly, the contrast between the background and the object plays a critical role in the ellipse determination. Switching to binary images, i.e. forcing a perfect contrast, may reduce the information in the image but is a quasi-prerequisite of the method. And as the method gives very nice result with binary images, this is not such a big price to pay. First of all, this is super helpful. Thank you! 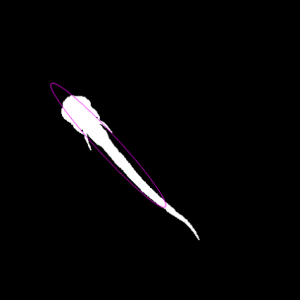 I am doing something similar with C Elegans nematodes, but this issue I have with tracking direction is that the worm is fairly symmetric, unlike the zebrafish above. Any suggestions for how I might extend what you've done here, but adjust for tracking direction in a symmetric object? Thanks for your nice comment. Unfortunately if the object is truly "symmetric", like a worm imaged with a low number of pixels, there is no way to determine a direction from a single image. I believe your two only options are 1) to zoom in sufficiently on the animal and have enough pixels to determine which side is the head and 2) track the animal and use the direction of motion as an indicator of the head. From my limited knowledge of C. Elegans this may be difficult since they usually swarm back and forth.